My two favourite pencils are both mechanical pencils. They weren't expensive but it's always handy to have one of these as you never need to carry a sharpener with you. 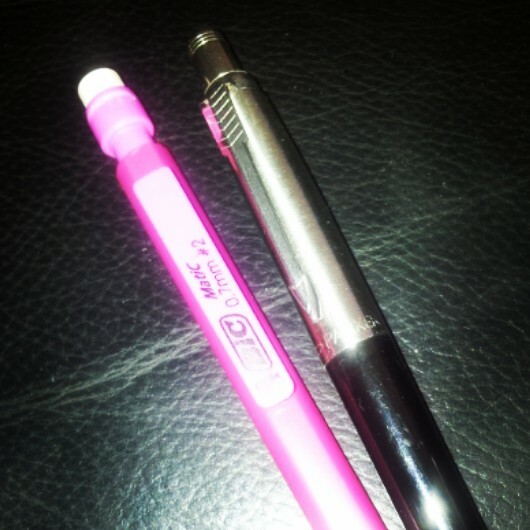 The pink one is a Bic with a 0.7mm lead. I have a few of these languishing in my box of stationery tricks (see the video at the end of this post). It is usually nestled in my Filofax to brighten it up. The black/silver one is from Parker and has a 0.5mm lead. I went through a phase of using only Parker pens and still have a few nice ones. I love that they aren't expensive yet have really lovely ink and nibs. I've even got my husband hooked on them. At least with pencil, if you don't get it right the first time, you can rub it out and start again! Oh, where do I start? Again, have a look at the video at the end of this post (if you haven't already) and you'll see my love of notebooks and binders. I have a couple of BOATs (Book Of All Things) - one at work and one at home - which are part of my thought process for life in general and where I empty my head of ideas and madcap brainwaves. I also make lists. I suppose it's a little bit like 'journalling' but not really on a strict daily basis. Next are my Filofaxes (yes, plural). I've recently returned to a Filofax after spending some time away thinking that I had fallen out of love with it but it was just completely unorganised and needed some TLC. As mentioned at the top of this post, I'm considering buying a new A5 binder and decorating it accordingly. I have my London Moleskine which was a present from Sian and has notes added each time I visit our glorious capital city. I use a Personal Planner notebook as my portable work diary (I received a voucher from Liska for this) and because you can personalise it, it's working really well for me at the moment. Because I ordered it midway through last year it only has a diary until August 2014 so I have to think of a plan for the final third of this year. A notebook you can't see on here is one that Steph bought for me and is a Waldo Pancake "Ideas For Tweets" jotter but I use that as a craft planner and it sits in my craft basket. I have loads of other notebooks in my spare room study and have no problem buying one when I'm drawn to it to stash away 'just in case'. As an aside... don't my friends know me well? I've included a picture of the pens I use regularly. I used to be a fountain pen user but some of the notebooks and paper I use don't soak up the ink very well. I wasn't sure if I should mention Frixion pens (thanks for the intro to these too, Liska) on Monday (Pencil Day) because of their erasability but, at the end of the day, they are ink so are getting included in today's update. As you have probably noticed, I like coloured pens! 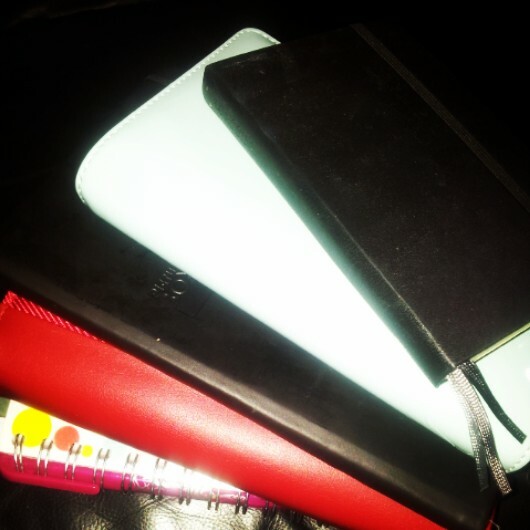 It's part of my self-organisation and helps me to keep one (portable) diary. I am currently using one orange and one purple Frixion pen, a Bic 4-colour pen and my Parker pen with a rollerball 0.7mm refill. Oh, and my London Underground pen (thanks again, Steph) is always nearby. If I am being totally honest, I prefer a thick barrel for a pen and it's one of the reasons that I don't use my Parker pen as much as I'd like. If you could write a note to me, what would it say? 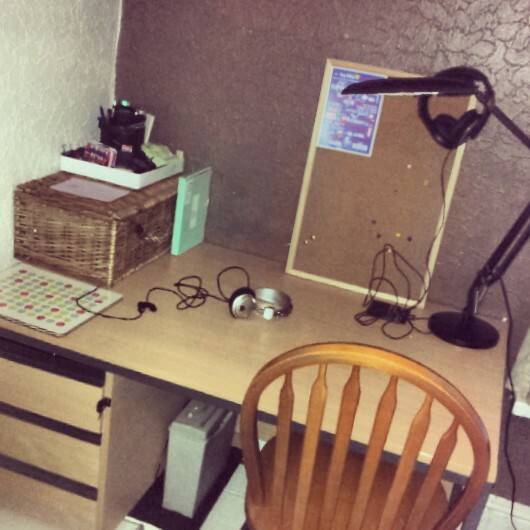 As mentioned recently, I am in the process of reclaiming the desk in my spare room ready to make it somewhere I can be a bit more creative. This also means that I have had the opportunity to have a great old clear out and also rediscover some lost necessities (we all need index cards and coloured paper clips, don't we? As an aside, here's a mini tutorial teaching you how to make hearts with coloured paper clips. I have every angle covered here, don't I?). So it all looks very minimalistic at the moment and there's a clue in the picture which points towards my new venture. It's a small space in the smallest room in the house yet it's my space. I only have one pencil case and it's not really used as a pencil case. I wonder if you can guess what it is used for? It comes with me every day. I keep my pens and pencils in storage boxes and upcycled tins in and on my (now tidy) desk. It's the only way I can find anything. All other pens that I take out with me are either slotted into my Filofax or clipped to my bag. 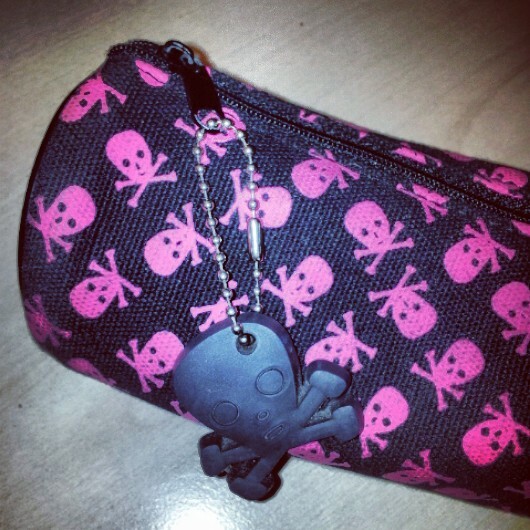 So this pencil case is my make-up bag. It means that I keep what I carry around with me to a minimum. I couldn't resist using it though. Pink and black? Tick. Skulls? Tick. Job's a good'un. I bet you all predicted this one. Obviously, the way I organise myself it with my Filofax but there's many reasons for it. First, I'm a traditionalist. If it's not written down, it's not happening. I do put important reminders or things I'm likely to forget when rushing around as timed alerts in my Google Calendar (synced to my phone) but I love being able to go back and read through notes that I've jotted down and expand on those ideas or physically cross things off on my 'To Do List'. Secondly, a Filofax is like a fingerprint. It is individual to the owner. Yes, the inserts are all the same (unless you print your own) but your handwriting makes it unique for a start and then there are numerous ways to decorate. 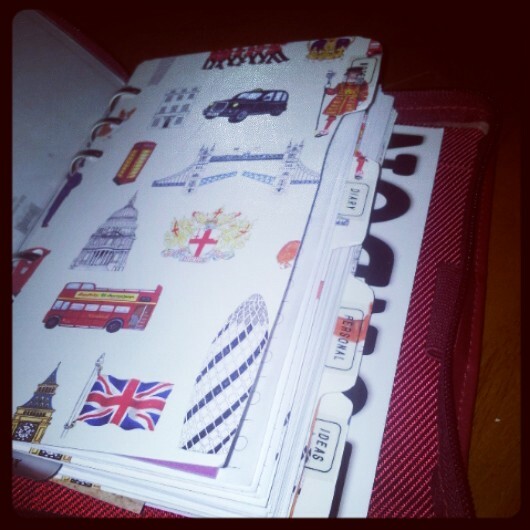 Your tabbed sections probably won't be the same as another Filofax user... I mean, what's the point of using someone else's organisational technique? Get your Filofax freak on. Bring back the retro. You know you want to. 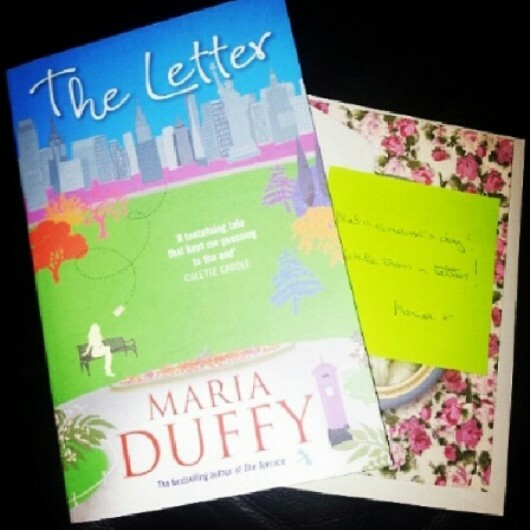 Not so long ago, I won a little giveaway on Twitter hosted by writer, Maria Duffy. She sent me a copy of her book, The Letter, and enclosed a notelet with a post-it note attached which said, "Make someone's day. Write them a letter." I haven't written the letter yet but I intend to. I think we - or at least the next generation - are losing the art of writing at length in our day-to-day lives. A lot of time is spent bent over a computer device or a mobile phone, tapping short messages to our friends via various method (SMS, social media, captions on images). We are getting used to sharing short snippets of our lives throughout the day rather than living our lives and sharing the important stuff with the important people. I'm all for short cuts but love seeing handwritten envelopes and recognising the writing, knowing that someone has spent time choosing and contructing the content inside. 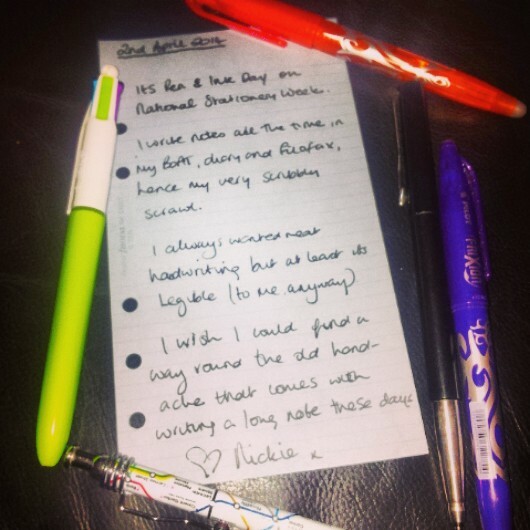 So this week you've learnt why I love stationery so much. It gives me the opportunity to write both at length and short messages (even if they are to myself). Writing these prompted updates this week has made me examine my obsession a little bit, given me the chance to reorganise myself and fall in love with it all over again.